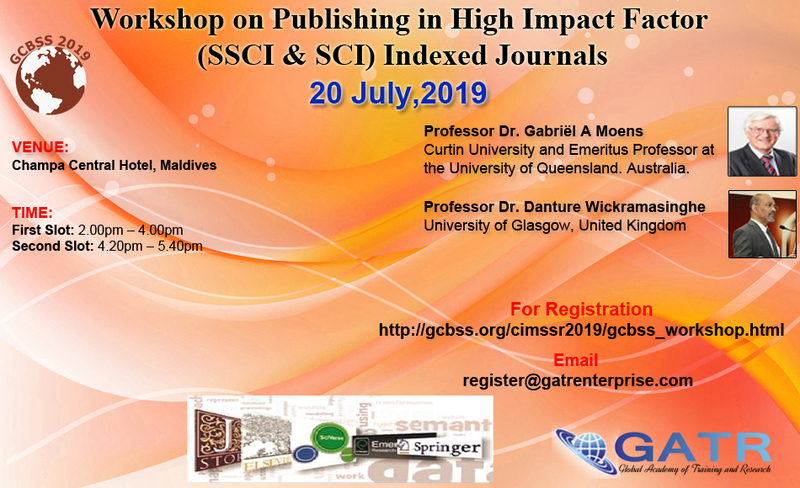 Global Academy of Training & Research (GATR) also offer post conference workshop on ''How to Publish in High Impact Factors ISI Journals". The purpose is to organize this kind of workshop just after the second day of conference is to provide opportunity to the delegates to learn the recent trend and technique of publishing in high order ISI journal. The workshop speakers are leading thinker and renowned research scholar of their field. The details for upcoming GCBSS workshop is in the respective conference pages. Please take note that, the speaker and topics are confirmed at the time of printing. However, any circumstances are beyond the control of GATR may necessitate substitutions, alterations or cancellations of the speakers and/or topics. Therefore, GATR reserves the right to alter or modify the advertised speakers and/or topics/ venue if necessary. Any substitutions or alterations will be updated on the web site as soon as possible. The Global Academy of Training & Research (GATR) in collaboration with the National and International Universities and Publishers such as University Of Prešov (Slovakia) , University of Kelaniya, (Sri Lanka ) and University of Brawijaya (Indonesia), Elsevier (UK), Inderscience (Switzerland), Czestochowa University of Technology (CUT) Poland, Cairo University, (Egypt), Kalasalingam University, (India), Asia-Pacific Institute of Dispute Management (APIDM) Australia, is organizing the Global Conference on Business and Social Sciences Series (GCBSS).